Brad Kutrow remembers – now almost 40 years later – what was going through his mind when he saw a picture in the 1979 UNC yearbook of two students dressed in KKK attire and carrying out a mock lynching of another student, who was in blackface. Kutrow was also a UNC student at the time and was an editor for the Daily Tar Heel’s editorial page. He wrote an editorial in March 1980 that has been recirculating in recent days after the photo of the students in the yearbook has drawn renewed attention, kicking off the tenure of interim chancellor Kevin Guskiewicz with some controversy. Kutrow, who is now a lawyer based in Charlotte, said that he grew up in Wilmington and his elementary school was integrated during his time there, recalling the protesting by some white community members. He said that he felt it was his role at the DTH to call out things on campus that he saw as wrong. 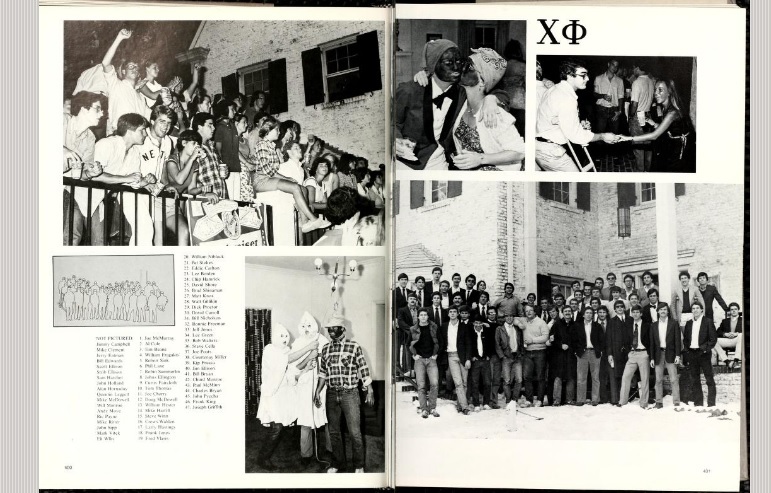 Students depicted in the photograph are members of the Chi Phi fraternity. Kutrow was a member of Chi Psi at the time and said there were some black members of his predominately white fraternity. “But I’d never seen anything like that,” Kutrow said. “I didn’t believe that kind of behavior could occur at my fraternity house; I’d certainly never seen it at other campus events or parties, and I thought it needed to be called out strongly. Kutrow said that he tried to bring the perspective of what it must have been like to see that picture as a black member of the campus community to his editorial. He pointed to the important work of archivists and historians preserving pieces of the campus history, which has allowed both the picture and the glimpse into the campus response at the time to come back to public light as multiple statewide elected officials in Virginia are caught up in scandals associated with blackface photos. Meanwhile, in Chapel Hill, administration officials are working with members of the UNC System Board of Governors to develop a plan for the future of the Confederate monument known as Silent Sam that had stood on the campus for more than 100 years. Protesters toppled the statue last August. The remaining base was ordered to be removed by then-chancellor Carol Folt in mid-January when she also announced her intention to resign. That plan for the monument’s future is due in mid-March. Interim chancellor Kevin Guskiewicz and interim UNC System president Bill Roper have said their preference would be for the statue to remain off-campus. 1979 UNC yearbook. Photo via digitalnc.org.